i have been getting my clams from a stand at the hollywood farmers market since i can remember. i just know them at the cute oyster boys. (seriously, what is it about fisherman? they must have the same genes as fire fighters and soccer players.) i found them on facebook, and you can follow them on twitter, but are fairly new to both. well, every sunday morning at their stand, they offer to shuck any oysters you want to eat on the half shell, but normally it just doesn’t occur to me to have oysters for breakfast. this past sunday it did. yummo! 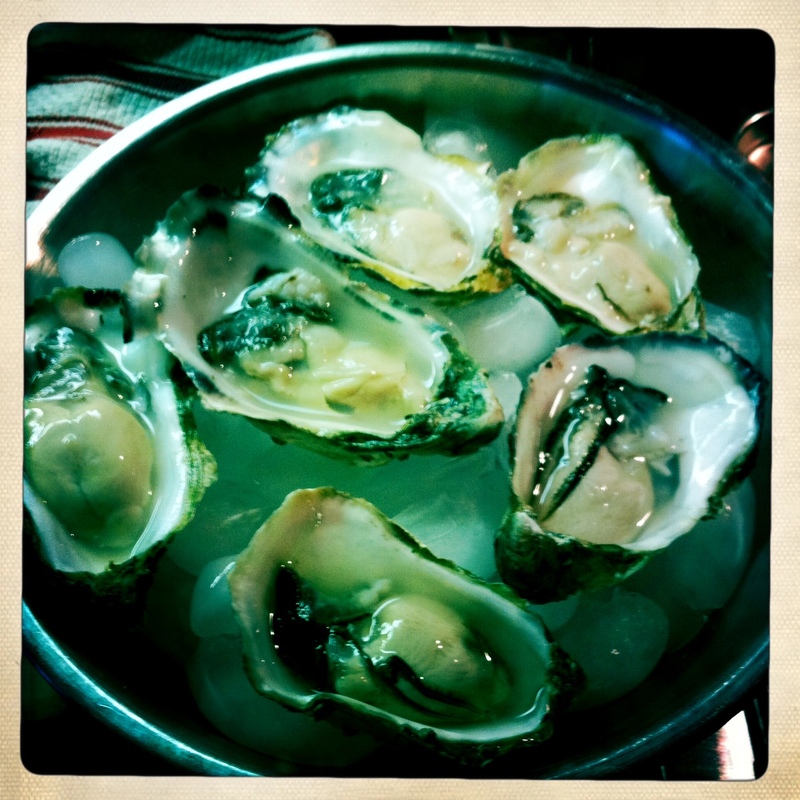 along with some mussels, i picked up a half dozen of their oysters. i went to ross cutlery today and got an oyster shucking knife, and pulled out a thick rubber glove and towel to prepare for my first shucking experience. 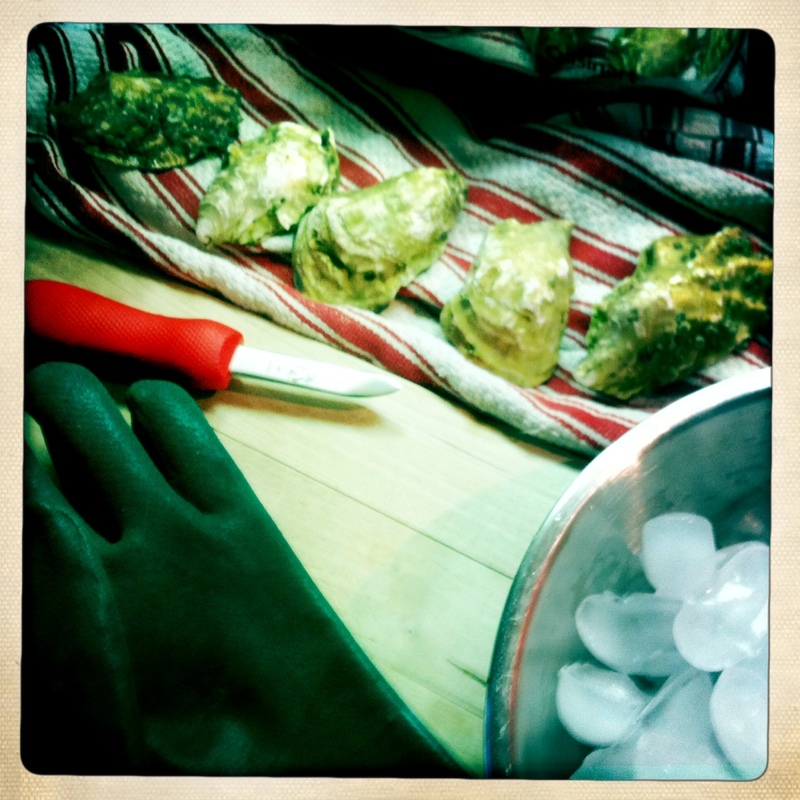 then i watched the oyster boys video on how to shuck an oyster…a few times. it was really a lot easier than i thought it would be. i put them on ice, and brought them down to the courtyard of my building to share with my neighbors. i served them with lemon wedges, a tamari sauce and ponzu mix, horseradish, and yuzu pepper on the side. good stuff! Scrumptious. and how generous of you to share! Hi fellow Hollywood farmers market shopper and food blogger! I found your blog when I looked up the url for the Oyster Boys. It looks like you covered that territory first. I’ll try not to copy you 🙂 We’ve also both just made gazpacho and love a good Reuben. Cheers!